Let me start by saying that I thought the storyline for this book was super cute. I love the idea of having a bucket list to help you get yourself out of a funk that life has thrown you in. This is something that I may have to consider doing myself this year. I think I enjoyed this part of the book even more than the romance parts, if you can believe that, and I would have loved to see Abby add even more things to her list. I really like the characters that Kasie creates in her stories, and I have to admit that the main character in this book, Abby, is one of my favorites, mostly because I found her snarky attitude to be very relatable. She made me laugh more than a few times throughout the story, and I always appreciate a good laugh, and I enjoyed watching her growth over the course of the story as well. I loved her relationship with her family as well, especially with her granddad. 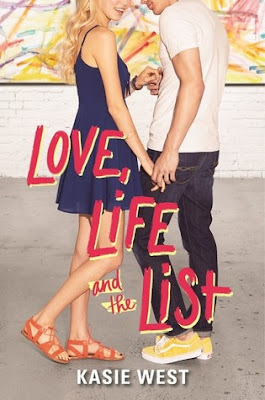 Overall; if you're a fan of Kasie's contemporary novels, you're definitely going to enjoy Love, Life and the List! It's a really quick read that is full of fun times and cool characters. Having finally read the book, I will now be anxiously waiting to get my hands on Kasie's next book, Listen to Your Heart, which is set to release in May 2018!